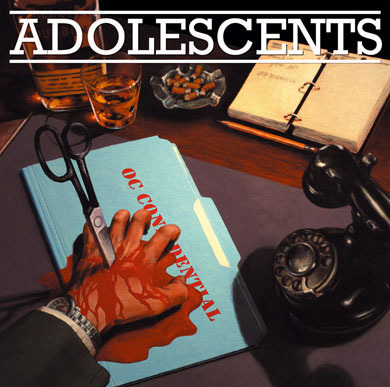 The ADOLESCENTS "OC Confidential" LP - finally on vinyl ! GV 014 >> The ADOLESCENTS "O.C. Confidential" LP - DISPONIBLE / AVAILABLE NOW ! This album, issued as a CD in 2005, was never properly released - ie : on vinyl. Now it is done. And we're happy with it ! Great album up to the expectations any Adolescents fan could have : catchy and intelligent, filled with infectious melodies and backing vocals ! As always ! A killer. WHITE vinyl, printed inner sleeve with lyrics. Co-released by Slow Death, Wee Wee, Opposite & Guerilla Vinyl. 1000 copies only ! Vinyle : 14 euros port compris pour la France. Chèque à l'ordre de DO IT YOURSELF, B.P. 135, 87004 LIMOGES cedex 1, France. Distros : contactez-nous pour les prix de gros !